Located between Cleveland and Akron, the 20,000-seat Richfield Coliseum was the home of the Cavaliers professional basketball team for twenty years and hosted more than 200 events annually. 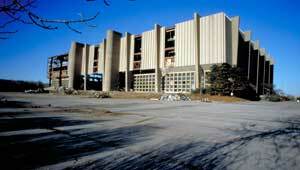 When the arena closed in 1994, commercial developers expressed interest in building a mega-mall on the Coliseum's site. At the request of local citizen groups and community leaders, The Trust for Public Land acquired the property, demolished the vacant arena, and transferred ownership to the Cuyahoga Valley National Park. By returning the land to its natural state, we helped ease the imminent threat of sprawl that would have impacted the small CVNP communities and the surrounding area.